They’re not old enough to vote, but they are old enough to have opinions on who should be running Alberta. Renee Ouellette and Hannah Feddema, students at W.P. Wagner School in Edmonton, vote as part of the student elections on Monday. They're not old enough to vote, but they are old enough to have opinions on who should be running Alberta. 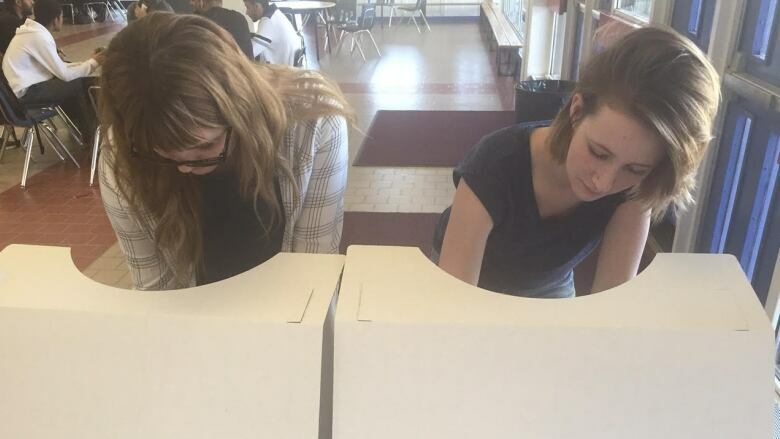 Today, more than 80,000 students from Grade 3 to Grade 12 will cast ballots in the provincial election with the goal of learning more about the provincial political system. "They're seeing and learning how they can get involved with government and politics and hopefully learning that politics is an interesting and exciting thing," said Dan Allen with Student Vote. The student election is run for students by students and is as close to a 'real' election as possible with ballot boxes, voting screens and the names of the candidates running in the riding where the school is located. There are 876 schools participating, with each of the 87 constituencies having at least one participating school. "When they turn 18, they will be not only educated enough about politics and the system that they will know how to vote, but they'll also be interested enough that they will want to vote as well," said Allen. Voter turnout for the 2012 provincial election was 57 per cent, high for Alberta and much higher than 2008, when 41 per cent of eligible voters cast ballots. Historically, young adults between 18 and 24 is the age group least likely to vote, according to statistics from previous federal elections. All of the students voting are under the age of 18 and voting is not mandatory. The result of the student vote will be released on election night, May 5, just after the polls close at 8 p.m. In the 2012 provincial election, the student results closely mirrored the real election results, when the Tories won a majority with the Wildrose as the official opposition.